Margaret Florence Newcombe was born in Grafton, Nova Scotia on December 10, 1856. She attended the Normal School in Truro and earned her diploma in 1876, winning one of two Governor General's Prizes awarded by the school that year. After receiving her diploma, she obtained a provincial teaching license and taught in rural Nova Scotia. In 1881, Newcombe enrolled in the Bachelor of Arts program at Dalhousie University. She was one of the first two women to be admitted to Dalhousie. The second woman was Lillie B. Calkin, who did not graduate. 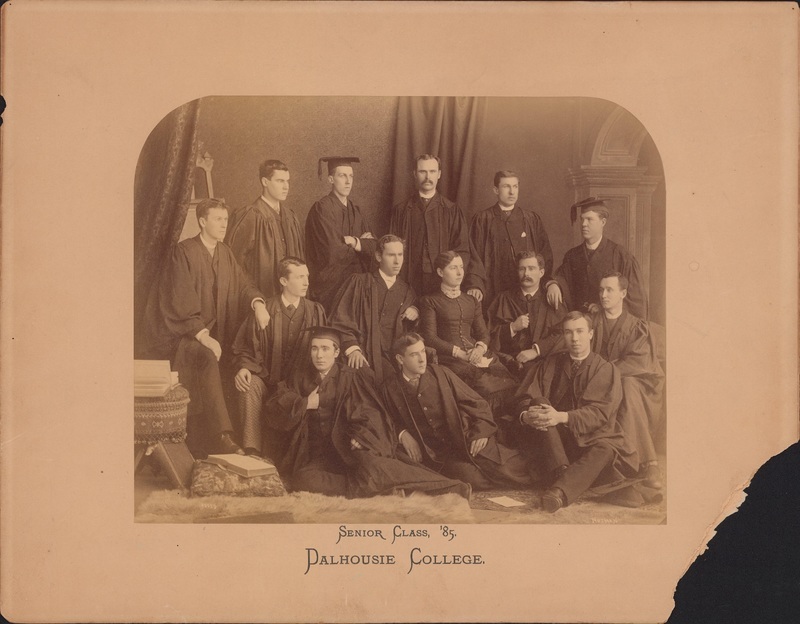 During her time at Dalhousie, Newcombe won prizes in in English Literature, History, German and Political Economy, as well as winning the Senior Munro Bursary in 1884. On April 29, 1885, at the age of 28, Newcombe became the first woman to graduate from Dalhousie University. After graduation, Newcombe went back to teaching at schools in Nova Scotia and possibly New England, including the Young Ladies School in Saint John. 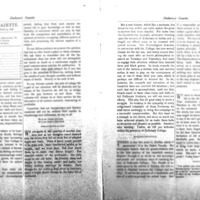 In 1890 Newcombe married Professor James Star Trueman, but she became a widow two years in 1892 when he died. After Trueman’s death, Newcombe went back to teaching and ended up at the Halifax Ladies College and Conservatory of Music. In 1898 she earned a Masters of Arts in History from Dalhousie. In 1911, Newcombe became the principal of Halifax Ladies College and she retired in 1918 at the age of 61. Newcombe moved to the Annapolis Valley and died on September 19, 1935, of pneumonia. "Ladies, we bid you welcome within the precincts of Dalhousie College." 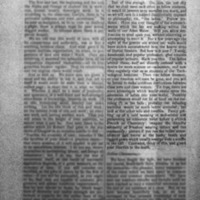 Editors of the Dalhousie Gazette and other Dalhousians advocated for the admission of women to Dalhousie, as shown in this editorial from the November 23, 1878 issue of the Gazette. "Then rise fellow freemen, or your freedom will soon be gone, and you will be forced to make invidious distinctions between class men and class women." This 1879 valedictory address warns about the risks of admitting women - like the need to get up early before class and perform an "elaborate toilette" in order to be presentable to the ladies! "It started 'by a letter being received from a lady asking for admission. It was submitted to the Governors, who decided that Dalhousie was open, with all its privileges, to any lady capable of entering." 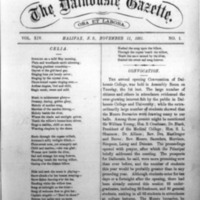 This issue of the Gazette discusses the admission of women to Dalhousie and lists the scholarships that the first two female students recieved. "Margaret, while I appreciate what you started 100 years ago, the 'you've come a long way baby' theme is far from true." 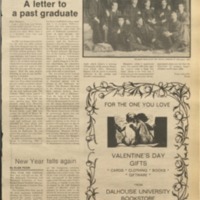 Dalhousie celebrated the centennial of women at Dalhousie in 1985. 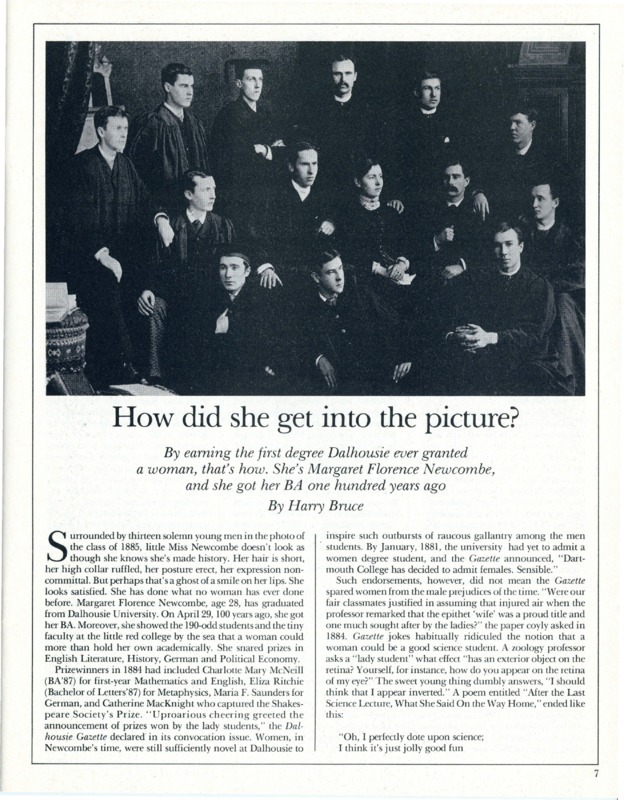 This article from the Gazette is addressed to Margaret Florence Newcombe and reflects on the status of women at Dalhousie over the last 100 years.